Tallahassee, FL— On December 18, 2014, President Obama announced the creation of a Task Force on 21st Century Policing. In part, the task force will examine how to strengthen public trust and foster strong relationships between local law enforcement and communities that they protect, while promoting effective crime reduction. Also, the task force is to engage in federal, state, tribal, and local officials; technical advisors; young leaders; and nongovernmental organizations to provide a transparent process to engage with the public. As in any case, whether it is civil or criminal, from the time law enforcement files an incident report all the way through court proceedings, transparency is the key to having a fair and just outcome. The Constitution of Florida (Ethics Law of Florida), Article II Section 8, which states—A public office is a public trust. The people shall have the right to secure and sustain that trust against abuse. No man can serve two masters. A situation which “tempts” to dishonor. The meaning and understanding of this law is clear—particularly—no man can serve two masters. In 2011, shortly after Rick Scott took the oath as Governor of Florida, Mr. Scott promised a continuation of government transparency—the Office of Open Government, which is supposed to help Floridians gain easier access to public records. Between December 2011 and October 2013, the mother of DeShon Thomas, had been in contact with Governor Rick Scott’s office. The major charges against DeShon Thomas were Two Counts of 1st Degree Murder and Possession of a Firearm by a Juvenile Delinquent. First, DeShon’s mother begged Governor Scott for a special prosecutor to be assigned to the case. Despite Second Judicial Circuit State Attorney Willie Meggs, himself, not directly prosecuting the case, Mr. Meggs had assigned the case to one of his Assistant State Attorneys/Prosecutors to prosecute the case. 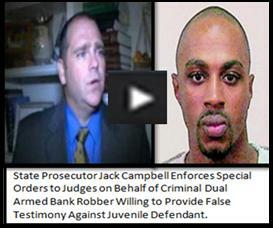 The Assistant State Attorney/Prosecutor in which Mr. Meggs had assigned to the case was John “Jack” Campbell. Assistant State Attorney/Prosecutor Jack Campbell is the son of Leon County Sheriff Larry Campbell. The Leon County Sheriff’s office was in charge of the investigation involving the charges in which then 17-year-old DeShon was facing. After DeShon had been in the Leon County Jail, in which Sheriff Larry Campbell was the overseer, DeShon and his mother had hired a private attorney by the name of Gregory Cummings. However, Mr. Cummings seemed to be struggling with doing what was best for DeShon, as a private paying client, and maintaining a certain “status/relationship” with Assistant State Attorney/Prosecutor Jack Campbell and Second Circuit Judge James C. Hankinson. It is believed that Mr. Cummings struggled with trying to “serve two masters.” On one hand, Mr. Cummings was being directly paid as a private attorney to represent DeShon. But on the other hand, Mr. Cummings and Assistant State Attorney/Prosecutor Jack Campbell had worked a number of cases together. In the past, Leon County Sheriff Larry Campbell had given his son, Assistant State Attorney/Prosecutor Jack Campbell and Mr. Cummings special privileges at the Leon County Jail. Without a doubt, Mr. Cummings had a close relationship Assistant State Attorney/Prosecutor Jack Campbell—who could “order judges” to provide income to certain attorneys registered with the Office of Criminal Conflict and Civil Regional Counsel. Any adult who publicly denies being bias in public business involving his/her parent is a troubled adult. Assistant State Attorney/Prosecutor Jack Campbell denied being bias when prosecuting cases involving his dad’s agency—the Leon County Sheriff’s Office. Yet, Assistant State Attorney/Prosecutor Jack Campbell used several of his dad’s employees (deputies) to smuggle contraband into the Leon County Jail and commit perjury. In November 2014, two Leon County Sheriff’s Deputies were ambushed by a lone gunman. One of the deputies and the gunman died at the scene. The day following the ambush, the Leon County Sheriff’s Office held a press conference to discuss the details leading up to the ambush. Front and center at the press conference was Leon County Sheriff Larry Campbell and his forty-year-old son, Assistant State Attorney/Prosecutor Jack Campbell. After Sheriff Larry Campbell spoke a few words to the media, Assistant State Attorney/Prosecutor Jack Campbell spoke to the media. Absent from the press conference (or just maybe not in front of the cameras) was Second Judicial State Attorney Willie Meggs. Mr. Meggs has been the Second Judicial Circuit State Attorney for over 25 consecutive years. Considering Assistant State Attorney/Prosecutor Jack Campbell was at the press conference, Mr. Megg’s absence was highly noticeable. In fact, it proved that Assistant State Attorney/Prosecutor Jack Campbell is bias—and Mr. Meggs’ supports that bias. A deputy killed in the line of duty is something that no sheriff wants to experience—but unfortunately—it happens. What do not happen are the appearance and a speech to the media from the State Attorney’s Office in conjunction with the Sheriff’s Office—especially not by an Assistant State Attorney. Considering Mr. Meggs has made appearances to address the media when there was questions in regards to the investigation (or lack thereof) involving Florida State University and Heisman Trophy winner, Jameis Winston, one could only see it as disrespectful to not make an appearance to address the community via media, after the ambush of two Leon County Sheriff’s Deputies, in which one deputy died. Assistant State Attorney/Prosecutor Jack Campbell’s presence at the press conference showed his support for his dad, Leon County Sheriff Larry Campbell—which shows a natural, healthy relationship between father and son. But also shows that “no man can serve two masters.” Assistant State Attorney/Prosecutor Jack Campbell should have never been allowed to prosecute cases in which his dad’s agency had jurisdiction. There were five attorneys on DeShon’s case at different times. After DeShon and his mother fired Mr. Cummings, DeShon’s case defaulted back to the court to assign an attorney. The Public Defender’s Office filed a Motion to Withdraw—which was granted. Then DeShon’s case was assigned to the Office of Criminal Conflict and Civil Regional Counsel’s Office. After six months the attorney resigned from the office. And the attorney who replaced him filed a Motion to Withdraw, that attorneys motion was denied. Soon after the denial of the attorney’s Motion to Withdraw, DeShon learned that the presiding judge, Circuit Judge Hankinson, had been playing a role in purposely denying DeShon’s right to Due Process. After a complaint to Governor Scott’s Office, another circuit judge was assigned to DeShon’s case. Circuit Judge Jackie Fulford picked up with the conspiracy where Circuit Judge Hankinson left off. DeShon’s was convicted without key pieces of evidence ever being given to him and the public. Assistant State Attorney/Prosecutor Jack Campbell, along with Second Judicial Circuit State Attorney Willie Meggs withheld the victims’ autopsy reports and DeShon’s cell phone records provided by AT&T. None of DeShon’s attorneys shared the evidence with DeShon neither did they push for their release to the public. Assistant State Attorney/Prosecutor Jack Campbell, along with Second Judicial Circuit State Attorney Willie Meggs intentionally filed court documents containing false information. Along with Leon County Sheriff Larry Campbell, Assistant State Attorney/Prosecutor Jack Campbell and Second Judicial Circuit State Attorney Willie Meggs supported a man impersonating a law enforcement officer. This man, Don Odham, was a family friend of the Campbell’s. It was Mr. Odham who paved the way for 17-year-old DeShon Thomas, a full-time freshman at Tallahassee Community College and employee at a fast-food restaurant, to be charged with Two Counts of 1st Degree Murder without any physical, material or circumstantial evidence against him. DeShon was convicted because of the refusal of transparency. Are Police Chiefs, Sheriff’s and State Attorneys across the state of Florida using “fake cops” to win the convictions of innocent defendants in order to fill Florida’s Department of Corrections 143 facilities? Not only is DeShon innocent—but DeShon is an inmate in Florida Department of Corrections. In 2014, shortly after DeShon’s conviction, it was reported that Governor Scott attended a fundraiser for his re-election campaign at the home of GEO Group Chief Executive Officer. GEO Group operates two of Florida’s prisons. According to reports, in September 2014, the Florida of Department Corrections Chief Mike Crews fired 32 Correctional Officers over the abuse and death of inmates. On November 6, 2014, Tallahassee reporter Mike Vasilinda posted an article in regards to a Correctional Officer who feared for his/her life and job if he/she reported the abuse which is the “culture” of the job. The Correctional Officer asked for anonymity. On November 24, 2014, it was announced that the Florida Department of Corrections Chief Mike Crews was resigning. Mr. Crews was the third Department of Corrections Chief under Governor Scott. Currently, the position is being filled on an interim basis. On December 16, 2014, in an abrupt manner, it was reported that longtime Florida Department of Law Enforcement Commissioner Gerald Bailey was replaced—his position is being filled on an interim basis. On December 24, 2014, longtime Leon County Sheriff Larry Campbell passed away. Governor Scott has the sheriff’s position being filled on an interim basis. Recently, December 29, 2014, it was reported that one of the 32 Correctional Officers who was fired—a former captain—had committed suicide. It was reported that Governor Scott spent nearly $100,000 of taxpayers money fighting to prevent emails from his Gmail account from being provided to the court. Next, Governor Scott began using his own personal money. Nearly three years later, the fight ended with Governor Scott having violated Public Records law. Could it be that Governor Scott fought so hard for so long because he knew that he was guilty of violating the law? Could it be that Second Judicial Circuit State Attorney Willie Meggs and Assistant State Attorney/Prosecutor Jack Campbell and others have intentionally committed crimes and violated DeShon’s Constitutional Rights because they know that DeShon is innocent? While other states have already announced their plans to reform their Criminal Justice System, in 2015, Florida State Legislature need to embrace President Obama’s 21st Century Policing and move forward to reform Florida’s Criminal Justice System. No man can serve two masters. Florida State Legislature cannot move to protect Floridians from the abuses of the Criminal Justice System (President Obama’s 21 Century Policing) and allow prosecutors to work with their relatives and “fake cops” to keep Florida’s Department of Corrections 143 facilities full via wrongful convictions. DeShon Thomas is innocent! Next Next post: Governor Rick Scott and Florida’s 2nd Judicial Circuit State Attorney Willie Meggs… Liberty County Sheriff Nick Finch and Gadsden County Sheriff Morris Young… Political Action?